Our final Top 20 shield nickel isn't really a shield nickel at all. Many shield nickel counterfeits were made. Some were cast, which provides an accurate representation of the coin but usually a pretty ugly coin. 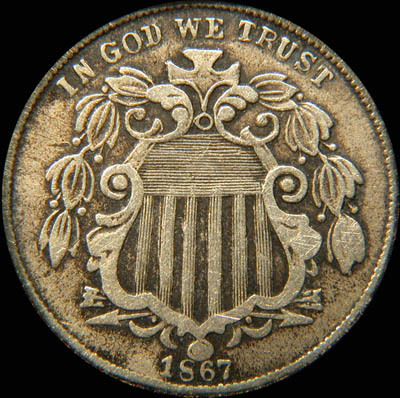 The more interesting shield nickel counterfeits were struck from false dies like the example here from 1867. Look closely at the 8 in the date, it is actually an upside-down S.
This particular counterfeit is catalogued as 1867 S2-9000 and F#1, and is chosen as a representative for all false die shield nickel counterfeits. 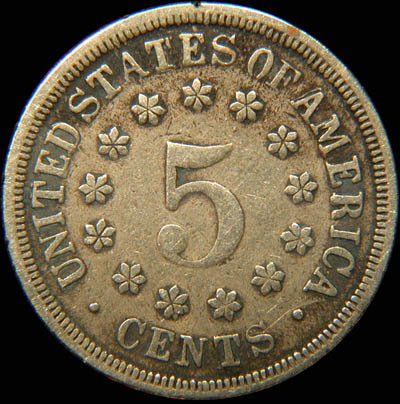 The collecting of shield nickel counterfeits is a very interesting adjunct to a shield nickel variety collection. There are many to choose from. While you may occasionally find one for sale, they rival true shield nickel varieties in their infrequent appearances in the marketplace.